A FORMER bus depot in Leicester is celebrating its tenth year since being rebuilt as a focal point for the city’s creative industries. The award-winning LCB Depot first opened its doors in 2004, following Leicester City Council’s £4.7 million redevelopment of the Leicester City Bus depot site on Rutland Street. Since then, hundreds of new and growing creative businesses have made the depot their base, helping to create over 350 new jobs in the city. To help mark this anniversary milestone, LCB Depot will host an exhibition by one of its first and longest-serving tenants, MGL Media. The video production company was set-up and moved into the depot in 2004. The exhibition – called ‘We Think in Pictures’ – will chart the company’s growth through films it has made for local businesses through to major international brands, including its award-winning work for Loake Shoes. Matt Holt, director of MGL Media, said: “As one of the first tenants at LCB Depot, we are delighted to be able to share and mark our tenth birthday in this way. “With a rich creative business community nurtured over the last ten years and its super-fast broadband, LCB Depot has allowed us to grow and embrace the changing world of digital film. In the ten years since LCB Depot opened, the city council has helped to create 27 managed workspaces at Phoenix Square, and 10 studios at the award-winning Maker’s Yard, all within the Cultural Quarter. City Mayor Peter Soulsby said: “I am delighted that LCB Depot is marking its first ten years by celebrating the successes of one of its longest-serving tenants. “Having workspaces like LCB Depot, Makers’ Yard and Phoenix so close to one another has helped to create a thriving community of artists, designers, craftspeople and creative entrepreneurs. To further mark LCB Depot’s anniversary, a bright new mural has been produced for the shared courtyard and the café is due to be given a makeover in October. A busy diary of events and exhibitions will also help ensure that the public can join tenants in celebrating this milestone. LCB Depot houses a variety of creative businesses and all of its 55 studios and workspaces are currently occupied. Tenants are entitled to a generous package of business support along with the unique opportunity to network with a wide range of other creative professionals. Peter Chandler, creative workspace development manager at Leicester City Council, said: “Our 10th birthday is a great time to celebrate one of the UK’s most dynamic creative communities. PROPERTIES in Leicester’s historic Greyfriars area are set to benefit from a major improvement scheme following a successful city council bid for over £ 1million from the Heritage Lottery Fund. Leicester City Council will receive a grant of £1.1million from the Heritage Lottery Fund’s Townscape Heritage programme to help restore and regenerate buildings in the Greyfriars conservation area. The project – called the Greyfriars Townscape Heritage Initiative (THI) – will see at least 20 of the most important historic buildings in the area around Leicester Cathedral shortlisted for grants to help pay for repair and restoration. Property owners and leaseholders and leaseholders will be able to apply for financial support to repair building frontages, to reinstate lost architectural features such as original windows, fencing and decorative masonry, or to bring empty floor space back into use. The city council has committed £450,000 of capital funding set aside for the Leicester Economic Action Plan to support the project. City Mayor Peter Soulsby said: “This is excellent news and I am delighted that the Heritage Lottery Fund has committed such generous support to this ambitious project. “Greyfriars contains many of Leicester’s historic and architectural treasures and it is essential that we continue to invest in celebrating the area’s heritage and realising its huge potential. The five-year programme will focus on buildings in New Street, Millstone Lane, Friar Lane, Wycliffe Street and parts of St Martins and Peacock Lane. There will also be a programme of events and activities to promote a wider understanding of the history of the area and its buildings. Vanessa Harbar, Head of Heritage Lottery Fund East Midlands, said: “Our city centres are full of important heritage, built up over centuries and giving a place its unique character. We’re pleased to support this project that will give Leicester’s Greyfriars area some much-needed attention and revitalise its historic buildings. The Greyfriars THI will tie in with the city council’s Connecting Leicester programme, which was seen the construction of Cathedral Gardens, Jubilee Square, improvements to Guildhall Lane and Applegate and the creation of the new King Richard III Visitor Centre. A new management plan and conservation area appraisal for Greyfriars was formally adopted by the city council last month, following a six-week public consultation. These will help identify what is special about the area, what should be conserved and how the area will be managed in future. 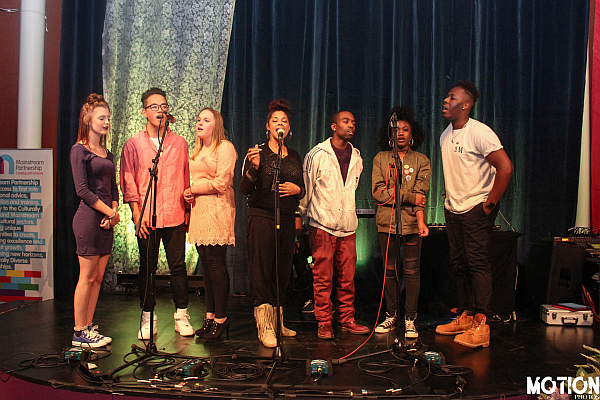 Local young people will perform at Curve Theatre, showcasing their vocal talent as part of a Youth Music funded project. Participants have been given the opportunity to improve their vocal and performance skills, with help from 2Funky Arts and professional singer Mellow Baku. Various young people will perform at the showcase on Saturday 8 November, 7-8pm. 2Sing is a project for young people aged 16-19, working with urban, soul and R&B, run by 2Funky Arts. This has been a unique opportunity for young people to express themselves through song. Workshops have been led by professional songstress Mellow Baku who Courtney Pine has described as “a new voice in British music…superb voice, brilliant music.” Young people have also taken part in masterclasses, residentials and recording sessions with artists such as singer-songwriter Carol Leeming. This programme is just one of the boredom-busting activities that 2Funky Arts are running this year. Young people can find out more about this and other exciting activities on http://www.2funkyarts.co.uk. This project is supported by Youth Music. LIGHTS will go out at key locations up and down the country tonight to mark the centenary of the outbreak of the First World War. At 11pm on 4 August 1914, Britain declared war on Germany. It was referred to as ‘the day the lights went out in Europe’. Lights Out is an invitation to everyone across the UK to turn off their lights from 10pm to 11pm on 4 August, leaving on just a single light. Nationally, Lights Out will see landmarks, key government offices, community venues and private households, including the Houses of Parliament, the Foreign and Commonwealth Office, Belfast City Hall, Wales Millennium Centre and the Scottish National Gallery taking part. Here in Leicester, the war memorial in Victoria Park will be a focal point for those who wish to take part in a shared moment of reflection. People are invited to attend between 10 and 11pm. Prior to this, teas and coffees will be served in the Victoria Suite at De Montfort Hall from 8pm to around 9.30pm, for members of the public who wish to attend the war memorial. The De Montfort Hall car park (University Road entrance) will be open and free to use for attendees. Attendees are recommended to bring a torch. City mayor Peter Soulsby said: “I’m glad that here in Leicester we are able to join in with this national hour of quiet reflection, which is a fitting way to remember the outbreak of the First World War. BELGIAN soldiers from the First World War who are buried at Welford Road Cemetery are being commemorated in an event this month. Nine Belgian servicemen, including one unknown soldier, were buried at the cemetery after they died in the nearby 5th Northern General Hospital, which is now the University of Leicester’s Fielding Johnson Building. The ceremony to honour the fallen men takes place on Saturday, August 16, with people meeting at the visitor centre at 10.30am ahead of the event at 11am. It will include a brief speech, a minute’s silence and wreath laying, giving each soldier his own poppy cross. The ceremony will also be attended by a member of the Belgian consulate. It is being held as part of the city’s First World War centenary commemorations, which began last month and which will include various events reflecting the course of the war and its impact on people in Leicester. Find out about Leicester At War, 1914 – 1915. NEW lamppost banners have been put up to showcase the historic village of Aylestone. The banners, which were developed in conjunction with local groups, feature pictures showing Aylestone past and present, celebrating the area’s built and natural heritage. The idea for the banners came out of the Story of Leicester workshops – in which local heritage enthusiasts were asked for suggestions to highlight the city’s rich 2,000-year history. Cllr Adam Clarke, ward councillor for Aylestone and English Heritage champion for the local authority, said: “I hope people find these banners interesting. We worked with local people and groups to come up with them. They are designed to raise awareness of the heritage of Aylestone village and of what Aylestone village has to offer now. There are some fascinating old photographs as well as some colourful new images. City mayor Peter Soulsby said: “Leicester is blessed with some fantastic historic villages within its city limits – Aylestone, Humberstone, Evington, Belgrave and Knighton. These villages are an important part of the city’s cultural and historical offer. Curve today announces the appointment of Nikolai Foster as the company’s new Artistic Director. Foster takes up the position in January 2015, succeeding Paul Kerryson who steps down as Artistic Director at the end of this year, after 22 years in the post. Foster joins CEO Fiona Allan, newly appointed Commercial Director Alister de Ternant, and a soon to be appointed Chief Operating Officer to create the new core executive team. Conceived by Allan, this new business structure is being implemented to optimise commercial income streams and create a sustainable business model. At the heart of this, Foster will be responsible for developing the artistic strategy for Curve, with an emphasis on continuing to grow the company’s national reputation for musical theatre, developing drama audiences, and building strong links with Leicester’s diverse communities. Nikolai Foster was born in Copenhagen, Denmark and grew up in North Yorkshire. He trained at Drama Centre London and at the Crucible, Sheffield. His work has been seen in many of the UK’s leading regional theatres, touring houses and internationally. Foster has been director on attachment at the Sheffield Crucible, National Theatre Studio, and an Associate Director at the West Yorkshire Playhouse, where he has directed Amanda Whittington’s, Bollywood Jane, Louise Page’s Salonika, Bryony Lavery and Jason Carr’s A Christmas Carol (also at Birmingham REP); Orwell’s Animal Farm, Annie and Sherlock Holmes – The Best Kept Secret. He is currently in rehearsals for Calamity Jane (Watermill Theatre). His other recent credits include The Memory of Water (New Vic, Stoke & Stephen Joseph Theatre, Scarborough); Brecht’s The Good Person of Sichuan (Mercury Theatre, Colchester); the 20th anniversary production of Jonathan Harvey’s Beautiful Thing (Arts Theatre and Digital Theatre); Merrily We Roll Along (Clwyd Theatr Cymru); The Diary of Anne Frank (York Theatre Royal & The Touring Consortium); As You Like It (Grosvenor Park Open Air Theatre, Chester), and Macbeth (Singapore Repertory Theatre). His other extensive credits include West Side Story (National Youth Music Theatre at Victoria Warehouse, Manchester); a new adaptation of Dickens’ Great Expectations by Tanika Gupta (Palace Theatre Watford & English Touring Theatre); Flashdance (Shaftesbury Theatre); Hay Fever (Chichester Festival Theatre); Barry Hines’ Kes, adapted by Lawrence Till (Liverpool Playhouse and The Touring Consortium); Andrew Lloyd Webber’s Aspects of Love (UK tour and South Africa); London Assurance (Watermill Theatre); and for Sheffield Theatre, Shaffer’s Amadeus, Sondheim’s Assassins and A Chorus Line. Centre Stage is Leicestershire’s rural and community touring programme, featuring performances in village halls and other community venues across the county. Supported by local volunteer promoters, the programme hosts a wide range of national and international touring companies and performers. From theatre to jazz, cabaret to folk music and dance to children’s shows, the programme features a diverse and hugely enjoyable range of performances for all ages. decorative arts, fashion, graphic design, digital art, game design and interactive art. Cross art form collaborations are also welcome. The call-out runs from Tuesday 27 May to Monday 30 June. See the UK Young Artists website | UK Young Artists Page on Facebook. The Phoenix Arts Centre. in Newarke Street, has been renamed the Sue Townsend Theatre – an excellent idea! There are also very encouraging signs that it might soon be brought back into use as a local arts base, partnering with local arts initiatives. However, the City Council’s planning department is proposing to turn the piazza outside the theatre into a car park. This is before arts groups have had a chance to suggest ways in which they can use that outdoor space for performances, markets, show spaces etc. which link to activities inside the centre. The Civic Society is asking all artists and arts organizers to object and thus help to preserve the piazza for future use. WORKS of art created by local people are going on display in Eyres Monsell. The artwork, which includes beadwork, paper flowers and silk paintings, will be mounted in individual display cases and showcased at Eyres Monsell Community Centre, in Hillsborough Road. The display is called ‘Community Threads’, and shows the diverse range of work local people have come up with while meeting at a variety of different community arts and craft groups. The work is part of a community project run by Leicester City Council and arts organisation Soft Touch Arts. The idea is to give people a sense of ownership over their community buildings. Julie Sibson is one of the community members who has been involved in the project. She said: “I’m really looking forward to having a permanent piece of work on display from such creative and talented local people. The community centre is the perfect place for it because everyone will be able to see the results of our hard work.” The display will be officially unveiled on Monday (2 June) at 1.30pm, by deputy city mayor Cllr Rory Palmer, who is also a ward councillor in Eyres Monsell, and fellow ward councillor Virginia Cleaver. Cllr Palmer said: “I’m really pleased to be unveiling the artwork at Eyres Monsell. It’s a result of the hard work and creativity of local people. “I fully support initiatives like this one because they help to bring communities together.” Cllr Cleaver added: “It’s been fantastic to see groups of local people joining together to support this project. As well as being an outlet for people’s creativity, these groups have a friendly, social side that people really appreciate. They’re a chance for people to get together.” The project has also seen artwork unveiled at other community centres across the city, in Braunstone, Mowmacre, New Parks and St Matthews. A SCHEME that acknowledges best practice in the UK’s museums as recognised all five of Leicester City Council’s museums. New Walk Museum, Newarke Houses Museum, the Guildhall, the Abbey Pumping Station and the Jewry Wall Museum have been awarded full accreditation by the Arts Council England scheme – signifying that all five are managing their collections effectively, taking good care of their visitors, and planning properly for the future. City Mayor Peter Soulsby presented the accreditation certificates to staff representing each of the five museums at a ceremony at New Walk Museum today (Wednesday). Cllr Piara Singh Clair, assistant city mayor for culture, heritage, leisure and sport, said: “I am very proud that all five of our museums have, once again, reached the high standards set by the national accreditation scheme. “This is a clear endorsement of the hard work that museums’ staff have put in. “Their efforts ensure that we continue to improve the quality of our displays while attracting touring exhibitions of national significance and providing a programme of events that are popular with visitors. Visitor numbers to the city’s museums have increased steadily since the 1990s, with key attractions – such as the Richard III exhibition at the Guildhall and popular weekend events at the Abbey Pumping Station – boosting numbers over the past year. Last year, a total of 462,525 people visited the city’s museums – up 32,000 from the previous year. This summer, the new Arts & Craft Gallery, the refurbished Victorian Gallery, the first of a series of World War One displays, the exciting and interactive Eye for Colour exhibition, and the Sikh Fortress Turban exhibition – on loan from the British Museum – are expected to prove popular with visitors to New Walk Museum. At Jewry Wall, a display about the history of archaeology in the city is a new attraction, while visitors to Abbey Pumping Station on 28-29 June will have a unique opportunity to see all four of its giant beam engines in steam as part of a special 50th-anniversary vintage festival.